With Halloween falling on a Saturday this year, Isla Vistans and other Santa Barbarans can look forward to a perfect storm of celebration, promising lots of people wearing less and drinking more. But what to do if you’ve outgrown DP and lower State? Head to New Orleans. 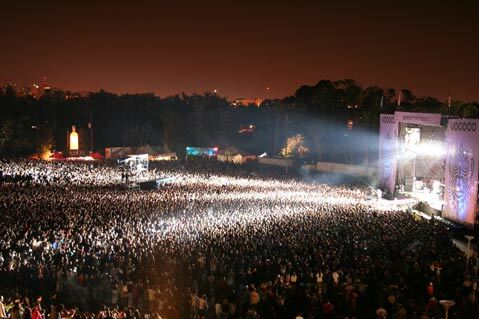 Since 1999, the Voodoo Experience has been Halloween weekend’s biggest and one of the year’s best live music festivals. Held on three stages in New Orleans City Park, Voodoo Experience programs high-profile acts alongside indie favorites and New Orleans heroes (like Walter “Wolfman” Washington). This year, Voodoo has Kiss and Jane’s Addiction headlining on Saturday night, but for many music fans, the more anticipated show is on Friday, when Eminem will give his only full-length performance of 2009. And things don’t stop there. Sunday, November 1, is booked solid as well, with the likes of Lenny Kravitz, Widespread Panic, and the Flaming Lips. And there are still plenty of single passes available through the festival’s Web site (thevoodooexperience.com). Now here are three good reasons to get up and go. 1) The Location: Coachella is great, but can you compare Indio to the French Quarter? Think of Voodoo Experience as an opportunity to shuttle back and forth between a great music festival and the country’s deepest urban party culture. The Voodoo Experience crew understand what they’ve got going for them, and, as a result, they have organized Voodoo 24/7, a series of performances that begin every night just as the festival ends. These concerts and events are spread across the best clubs of New Orleans, and there’s bound to be something great every night, with secret guest appearances by major festival acts a big part of the excitement. 2) The Morning Ritual: Republic, one of New Orleans’s biggest and most popular nightclubs, sponsors a morning party every day of the festival that features an open bar of Cajun Bloody Marys, mimosas, and coffee drinks, and includes a shuttle-bus ride to and from the festival venue. The club is located near all the major hotels, and you can take your cocktail on the bus because, hey, this is New Orleans, and that’s how they do. 3) The Slim Shady Factor: Eminem’s emergence as a popular artist can be traced directly to a breakthrough appearance he made at the second Voodoo Experience back in 2000. He’s almost a decade older, and, if anything, much weirder now, and he hasn’t been as idle as it might appear. He’s been rehabbed for a reported problem with sleeping pills, but his new album, Relapse 2, is set to drop in November. Let’s see who Slim Shady decides to be for Halloween, shall we?